Glen has got to be the 34th person (today) who has proposed the “Hey, you should do a Barack O-BOMB-A t-shirt!” idea. It’ll never ever happen, but in case it does, give him all the credit. 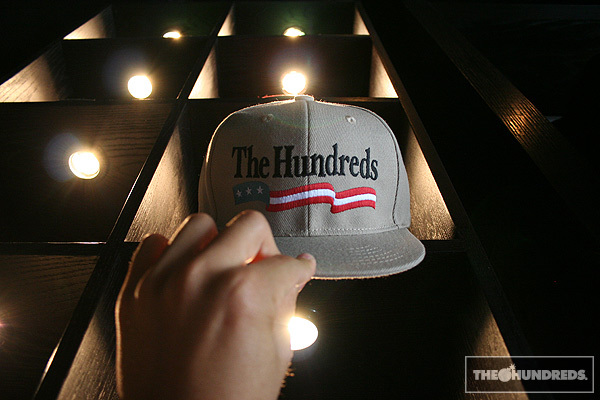 There’s a grip of new stuff down at The Hundreds LA, The Hundreds SF, and your local The Hundreds retailer right now. And from what I’m hearing, much of it has already sold out or is on it’s way there. Like the “Swino” tee, which is turning out to be a sleeper hit. Yeah, a little tribute to L.A.’s most popular foodpiece. The street dog, ghetto dog, whatever you wanna call it. There’s nothing like the sweet smell of bacon-wrapped hot dogs sizzling on the street corner when you’re leaving the clubs at 2am. It’s funny that a lot of cut/sew heads are finally starting to take serious notice of our more sophisticated apparel, like the wovens and more technical tops, considering we’ve been running the same game for years now. 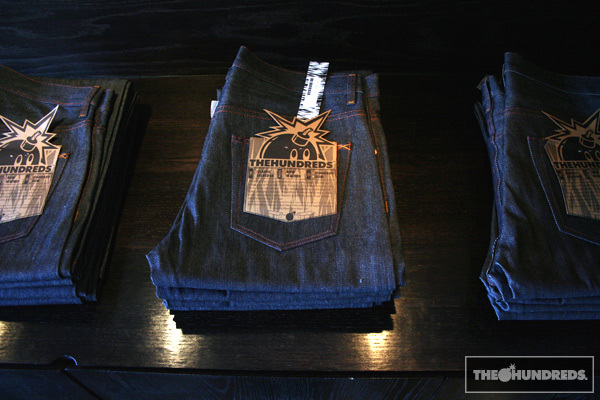 Especially when it comes to our denim program, which is heads above the rest. 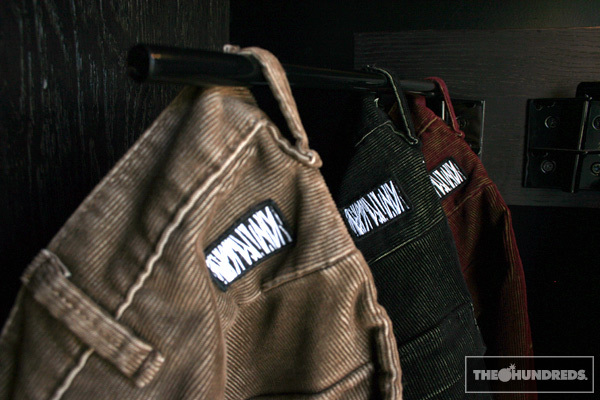 If you’ve only come to know us for our graphic tees, then you gotta try on some o’ dem jeans. 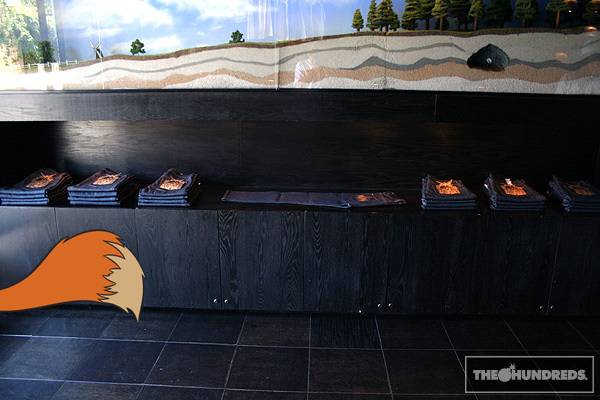 Or just ask your buddy who’s been whiskering out his unwashed selvedge pair that he picked up from us 2 years ago. 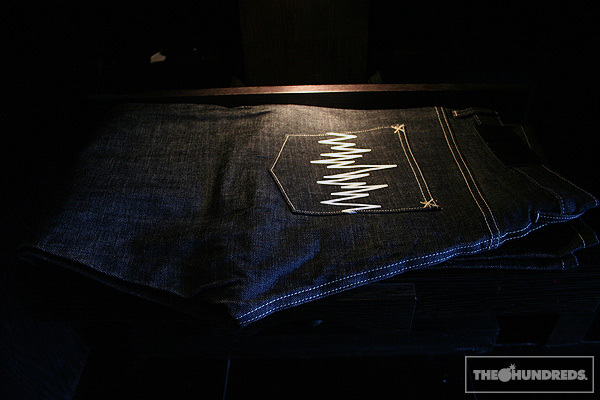 This is our basic “Classic” denim that can appease even the most finicky of fashionistas. A straightforward 13oz. indigo ring raw, structured around our Standard Fit, with an 18″ opening. A heavy gold JAGS whip-stitch to offset the deep blue. Minimal metalware, instead I chose to go with bartacks to secure the pockets and seams, maintaining that timeless, modest aesthetic. Cardboard stiff at the start, eventually relaxing into a broken-in silhouette. That missing metal in the “Classics” is compensated-for in the “Heavy Metal” jeans. My personal favorite. 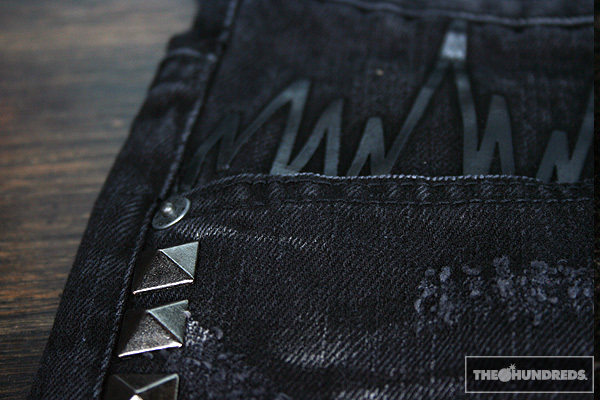 It’s hardware-overload with this distressed black Slim-Fit washed denim. The rivets, chunky zippers, and buttons are finished with a smoky gun-metal black, and highlighted with pyramid studs that line the right seam. This time around, I switched up the JAGS with a rubberized print. 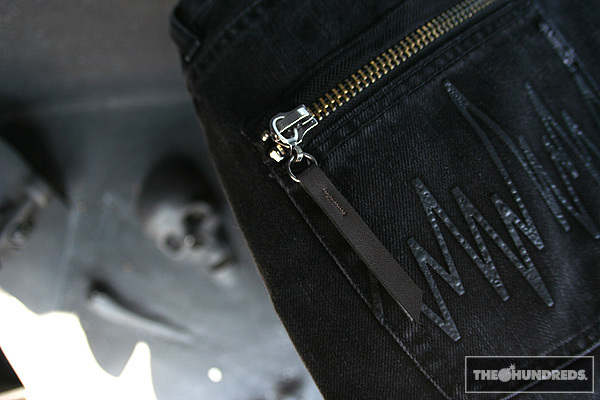 Our “Hollywood” denim is a 13.5oz sulphur black raw selvedge with a Slim Fit 16.6″ leg opening. 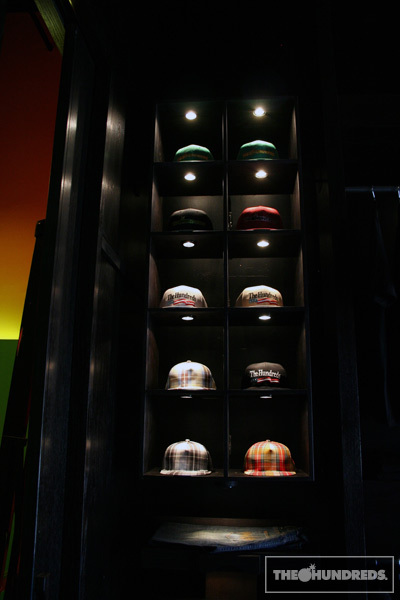 Accented with red plaid flannel that lines alternating panels, and locks up with some other pieces in the Fall range. And the “Stanwood“s also fall in at 13.5oz, which is a good weight for the latter end of the summer. Cotton indigo raw selvedge denim with a Standard Fit. 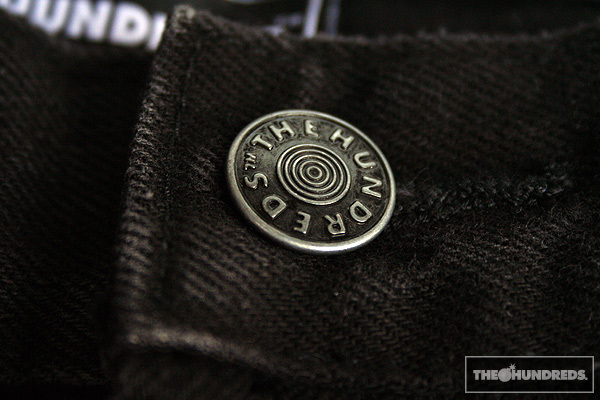 Off-white single-stitch to hold down the back-pockets and a bright white silk-screened JAGS as the signifier. 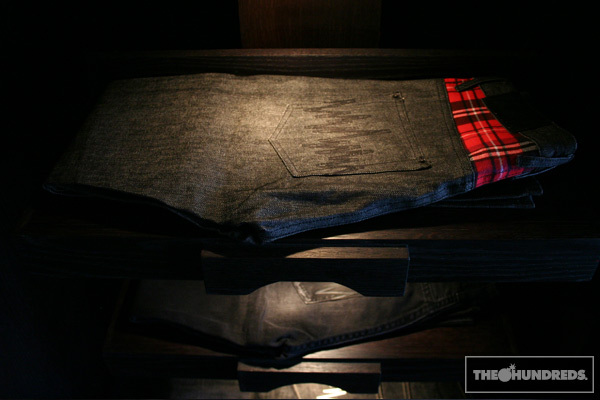 And of course, if you’re not into denim, the slim-fit corduroys are on point. 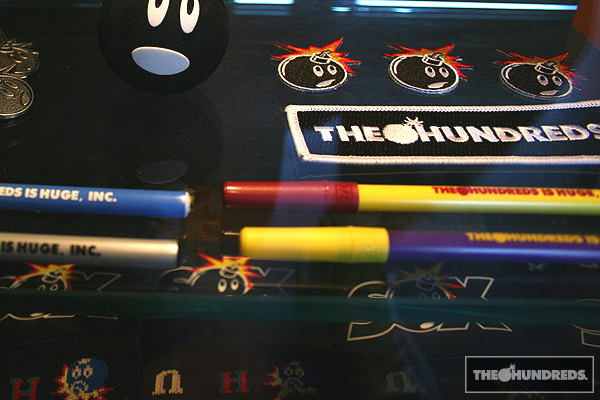 There are some other bangers, some of which can only be found at The Hundreds retail stores. 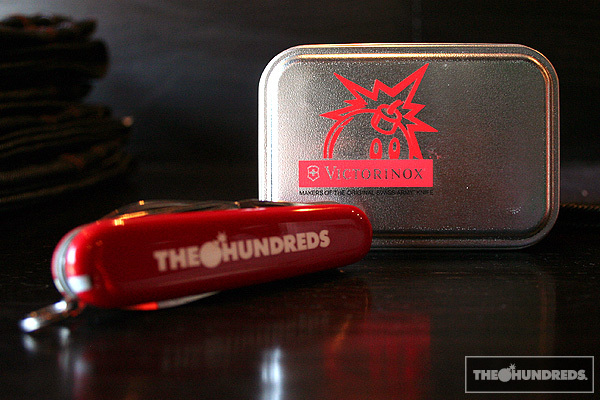 For example, the official Victorinox Swiss Army Knife by The Hundreds. Only 30 of each colorway (red, black, or green) available at each store. More assssssesssories. 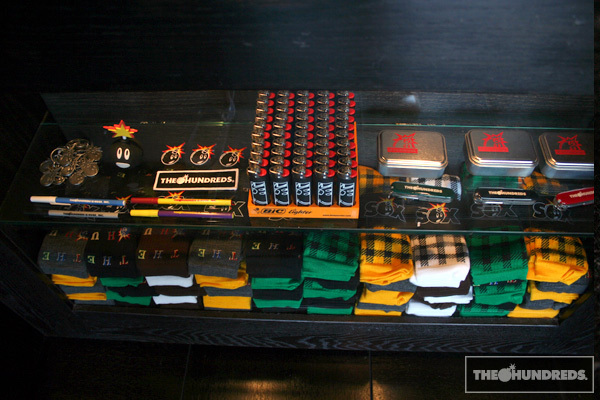 Bic lighters, “Custom” and “Buffalo” socks. 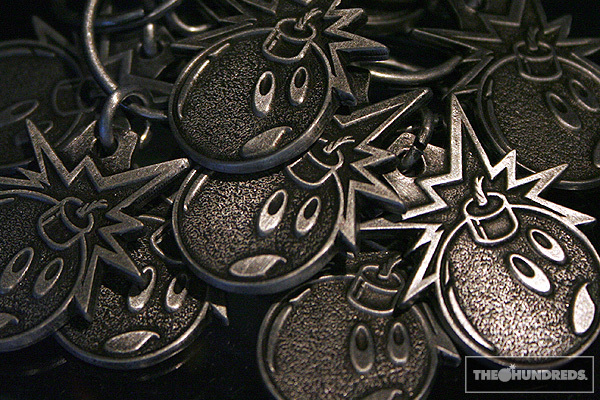 Metacast metal “Adam Bomb” keychains. L.A. sportsteam color Bic pens. 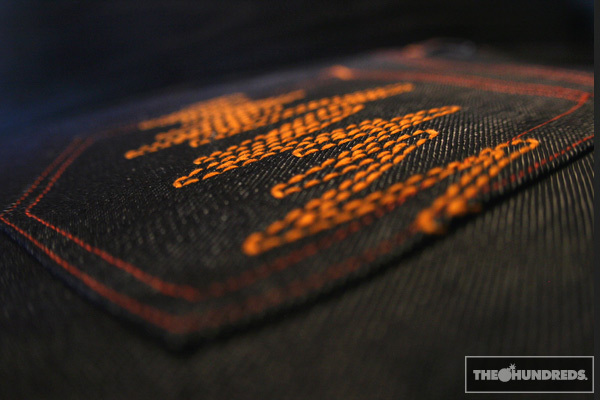 Iron-on patches for your beatdown Jansport backpack. Back to school and back to reality, kids. 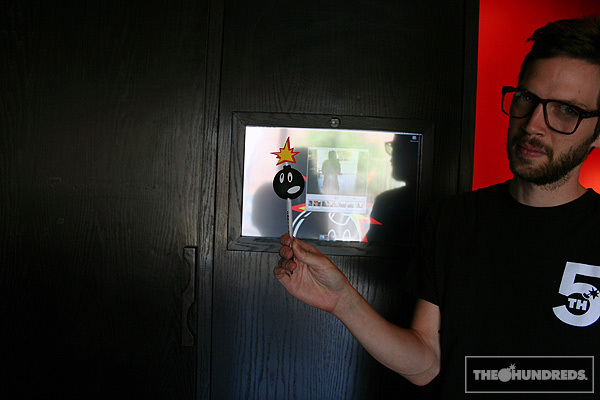 Patrick’s retarded Adam Bomb antenna ball is not for sale. 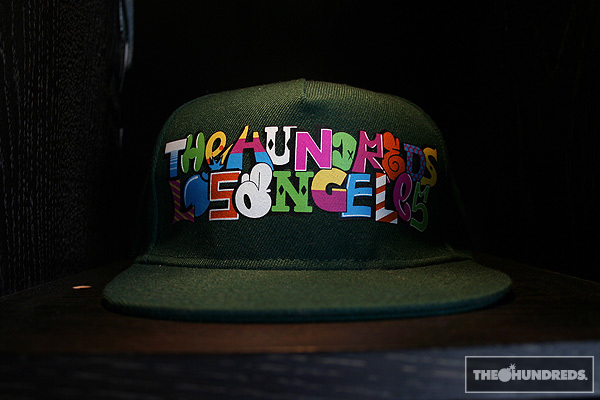 Top it off with a The Hundreds snap-back.